This is the real life story of a survivor. A deeply loved and loving wife, mom, friend, and member of her community, who at a very young, involved and vibrant fifty two years old was struck with a malignant Brain Tumor. The consequences of the treatment for that tumor were two massive strokes that left her paralyzed and completely dependant on her caregivers. Yet, her remarkable will to live and desire to continue to love her family despite the grim prognosis from medical professionals is inexplicable. It is also a story about the necessity of becoming an advocate. It’s about a dedicated husband with no medical training. A guy who owns a Hardware Store, fighting and navigating the complicated health care system technically, morally and legally. It’s a story about the uncanny communication they had at a time when she couldn’t speak or move her body, except for her eyes. But most of all it’s a story about total commitment and the love that has kept her alive. This is an amazing read on so many levels! It really make you be thank-you for all your blessings. I am so poud to have cousins like Mike and Kath, you to are A real inspiration to me to never give up, and to pray all the time and trust in the Lord. I love you bothe. You are always in my prays. A heartfelt book explaining the importance of being an ill family member's advocate. 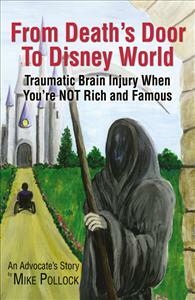 A good read for those struggling with medical bureaucracy. This book had me in tears and smiling at different times. It tells how those closest to the patient KNOW more about the person than any expert. I am a primary care provider and this only reinforces the fact that we have to LISTEN. Thank you Mike, Kathy and sons. Your dedication and insight are my inspiration. Can read in one sitting. Love, tears, inspirational. This book tells you, 'PULLING THE PLUG IS NOT AN OPTION". I think of the story of 'JOB', in the Torah, and the Old Testiment. God rewards you for your faith in HIM.